Rick Spitzer | Special to the DailyA semi truck pulling two trailers fell Sunday morning from Interstate 70 to Avon Road, landing on an SUV. One person died and three were injured in the accident. I-70 was closed in both directions for several hours. But that’s how they described the immediate aftermath of a horrific crash, when they witnessed two people walk out the wreckage unharmed. The crash occurred at 9:54 a.m. when a semi truck driver hauling two trailers lost control in the westbound lanes, sending the truck flying off the overpass at Avon Road. One of the trailers landed on a Honda CR-V traveling south on Avon Road, crushing the driver’s side of the vehicle. The driver of the semi truck was left dead in the accident. The MacCutcheons were traveling north on Avon Road and saw the crash happen before their eyes. Rick MacCutcheon said the rear trailer had become detached and was traveling at a high rate of speed, both airborne and facing backwards when it flew off the highway and landed on the CR-V. Moments later, the cab and trailer to which it was attached also tumbled off the overpass. Moments later came the second explosion, which witnesses described as being 50 feet high and deafening. The driver of the semi was killed during the crash, Eagle County Coroner Kara Bettis said Sunday. It will take longer than usual to positively identify the body, Bettis said, but the victim was male. “We should know in the next couple days,” she said. Bettis said the body will undergo an autopsy today. “I’m praying for him and his family,” Joanna MacCutcheon said. A passenger in the semi was treated for non-critical injuries at Vail Valley Medical Center. The couple in the SUV were also treated for non-critical injuries, authorities said. Witnesses said the heat from the second explosion could be felt from far away. “I’m surprised it didn’t bring down that bridge,” Byron said. 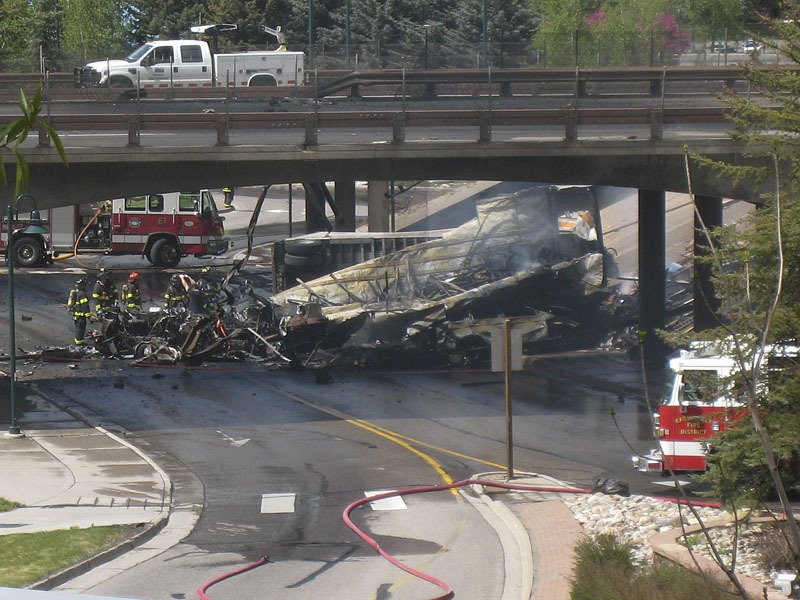 A structural engineer from the Colorado Department of Transportation was examining the bridge Sunday to see if its integrity was compromised in the crash, explosion or ensuing flames.